Here in step 1 l am really just giving myself a guide to where l want the scales and how many scales l need. To try and make it simple for myself l look hard at my reference photo and try to see rows. First l will look just for where the vertical rows are and draw those in. You can see how they follow the contours of the arm and how they narrow in parts. Then l do the same with the horizontal rows. And so l end up with a grid like the one above. 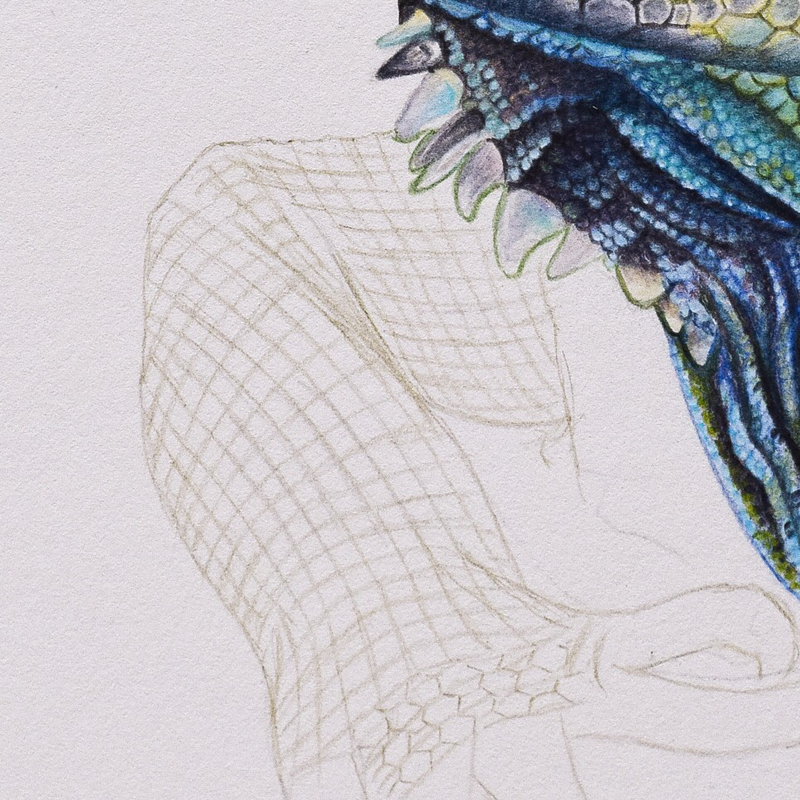 I try to make sure there are roughly the right number of rows, it doesn’t need to be spot on, but it does need to be close if your scales are to be the right size in relation to the lizard. Each one of these squares will become a scale. For this l use a mid shade of colors l will be working with, these lines l do not want visible at the end. I used Caran D’ache Pablo’s in Olive Black. You can see how the shape of the hexagons stretches or squashes as l follow the squares to fit the contours of the arm. To draw the hexagons l have used Faber Castell Polychromos in Chrome Oxide Green. ln step 3 l begin to map out the basic colors. I use a layer of Caran D’ache Luminance white down the middle of the arm where l want the colors to be paler and a little highlighted. l use Pablo’s Spring Green and Moss Green and Holbein Apple Green, Leaf Green and Surf Green. Although it is hard to tell at this stage l am using the darker colors for the more shadowed areas of the skin and the lighter colors where the skin catches the light. It is still very basic looking at the moment. In step 4 l went over the whole arm with Faber Castell Polychromos in Leaf Green, this was really just to bring the same color throughout the whole of the skin to make it feel harmonious. 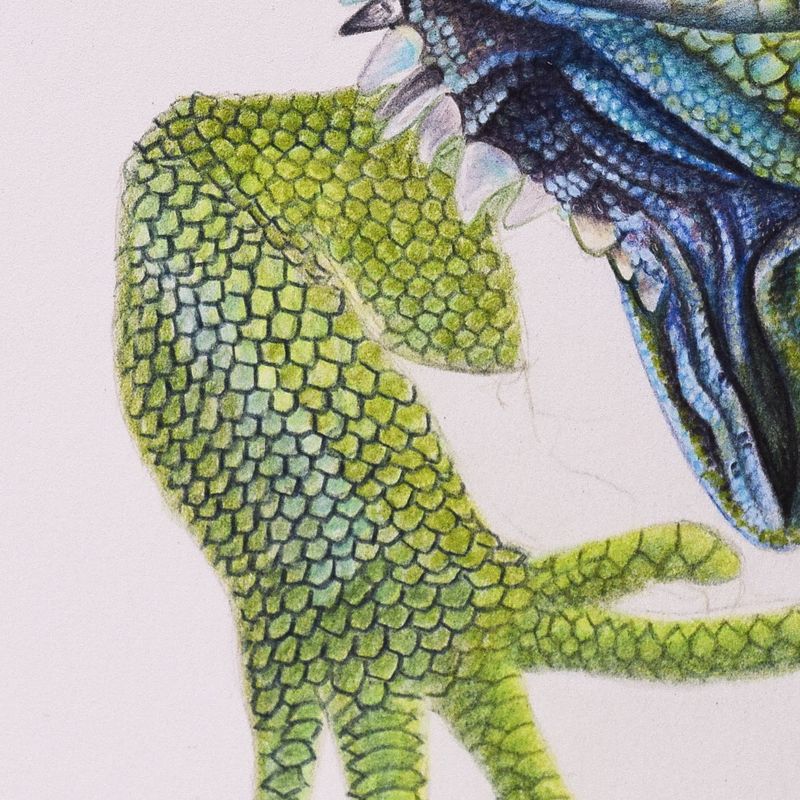 I then used Polychromos Dark Indigo and Chromium Green Opaque to outline each individual scale again, this time l am much more careful and l round the tip of each scale where it overlaps the scale below. This makes the scale look more realistic rather than just a bunch of hexagons. 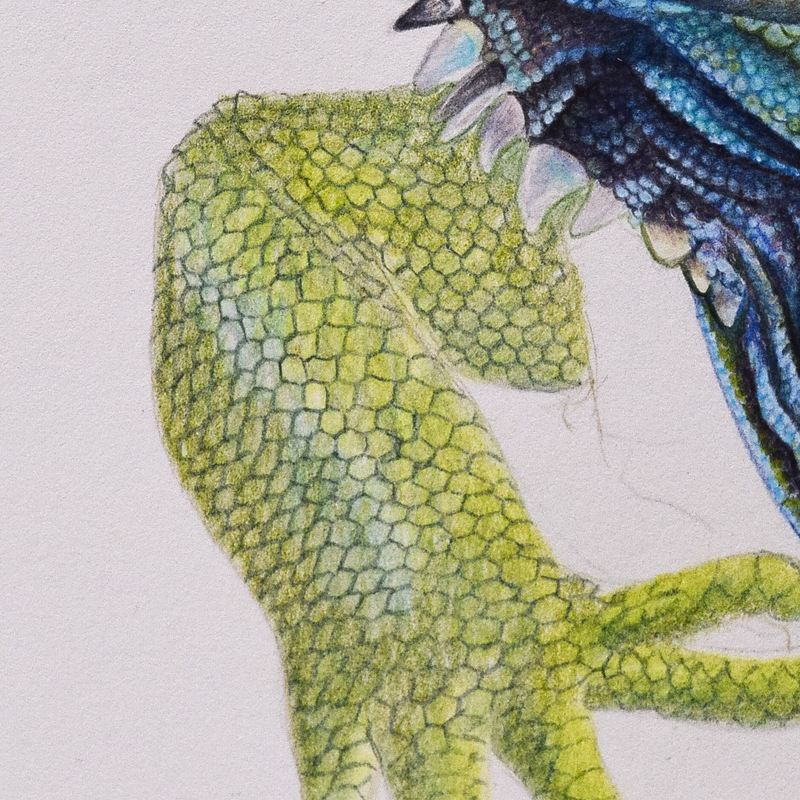 I then add a little shade under each scale using Holbein Leaf Green and Cactus Green and l pull out a few of the scales that have bluey tones to them using Holbein Surf Green. Step 5 is interesting because l basically just used two colors here. 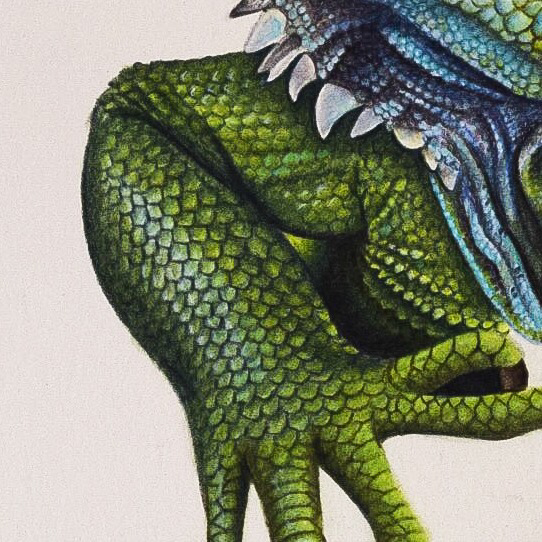 I added Pablo’s Moss Green over the lighter parts and Polychromos Chrome Oxide Green over the shadowed parts. Just this shading really starts to add life and depth to it. 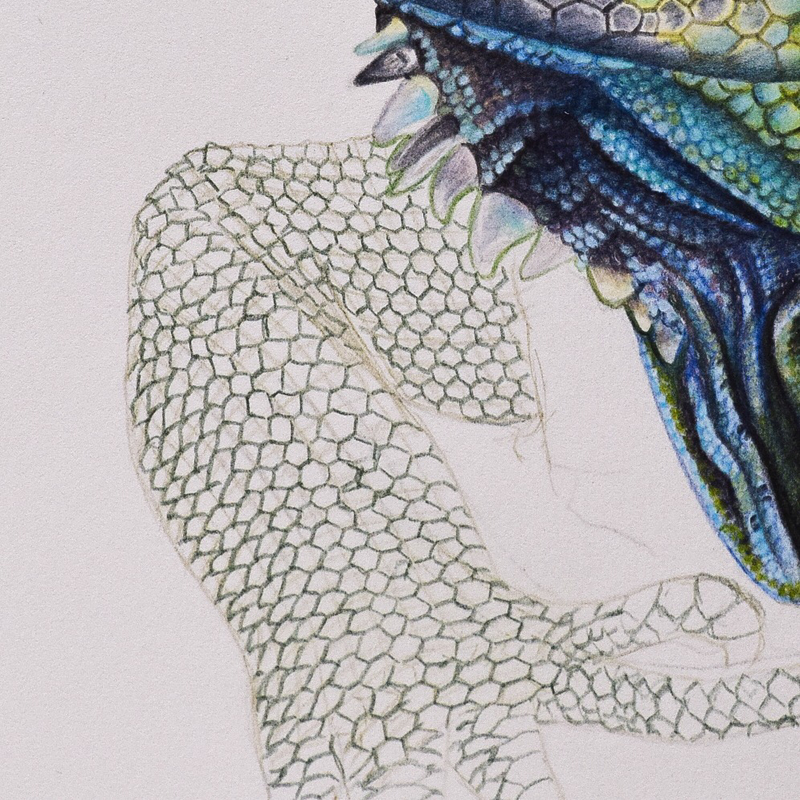 The only other thing l did in this photo was add a few highlights of Holbein Jade Green to individual scales. In the final step above l spend a lot of time looking at my photo and adding little bits of color here and there, really deepening what l already have and adding vibrancy. ​I use Holbein Apple Green, Leaf Green and Cactus Green. I pull out a few highlights with Luminance Buff Titanium. 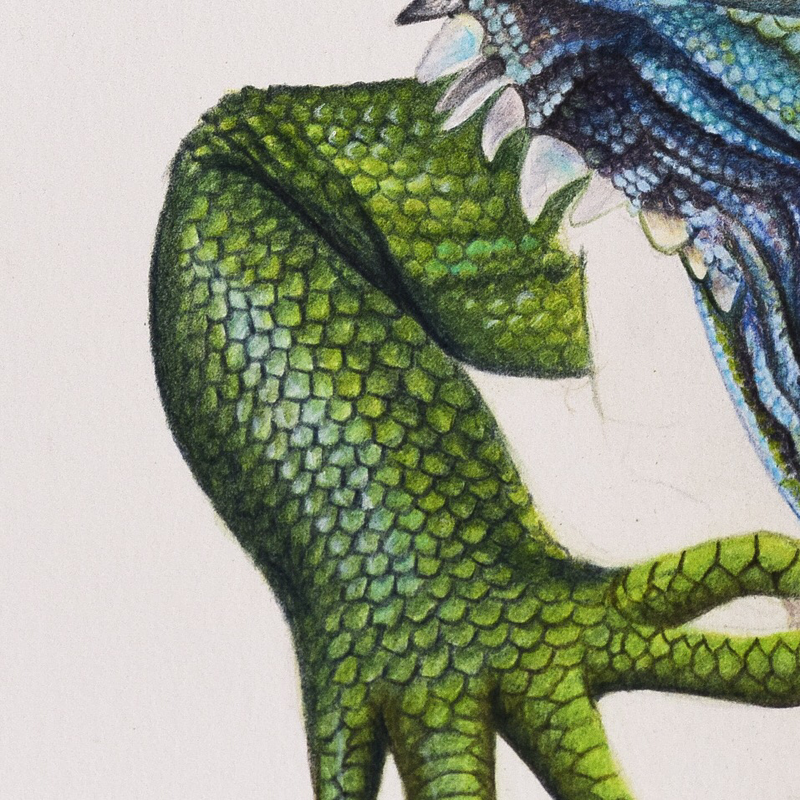 Then l use Polychromos Dark Indigo, Chromium Green Opaque, Dark Sepia and Payne’s Grey and Pablo’s Olive and Olive Black to boost the depth of the shadows and pick out individual scales more.